The following review of "She" is by author Kya Aliana and was originally posted at Goodreads on January 14th 2013. Kya is a phenomenal young talent who has exploded onto the literature scene with two knockout Young Adult horror/suspense novels "Impending Doom" and "Sky Darkness". "Every time I crack open a book, it's like a portal into a brand new, fresh world of creativity and motivation to create my own world. 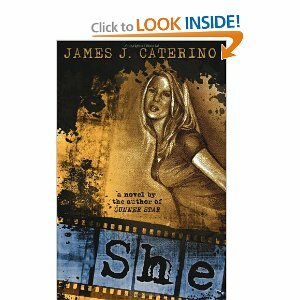 Sometimes, I'll have to put the book down to write for a few minutes before picking it up again... but that's only if the book is insanely good - such as "She" by James Caterino. Seriously, people, I cannot recommend this book enough. I almost didn't want it to end it was so good, and it inspired so much creative writing I did. Though I have read a lot of books, this one really stood out. The plot line is unbeatable, unpredictable, and overall outstanding. The sentence structure is amazing - I wanted to write down every other sentence in this book because it was that good. And don't even get me started on the dialogue - talk about realistic! I could hear the conversations in my head so perfectly, I knew exactly who was speaking and how they were saying it... I could even picture the body language. This book, this incredible book, has set a new standard for my writing. It's made me look ahead to how I want to be, look back at what I need improvement on, and if I need a motivation boost, I just read a paragraph or two and suddenly my story comes out just how I want it to sound. I look up to James Caterino with great awe and amazement. If you haven't read his books, I highly suggest putting them at the top of your "to read" list. Action packed, with characters that literally come to life and befriend you. I only wish I could thank the author profusely in person for writing, and tell him to never, ever, ever, ever stop."